This little mushroom is one of dozens of nondescript, brownish Mycena species--but it has just enough distinctive features to separate it from the monotonous masses. 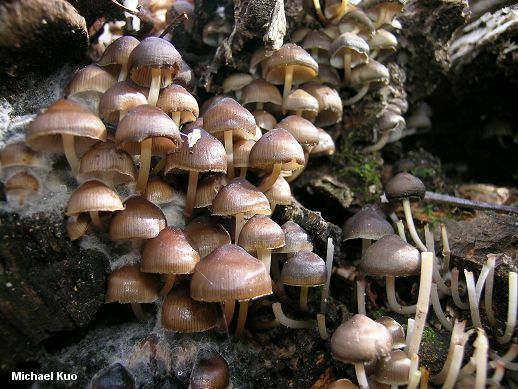 It grows in very dense clusters on the wood of hardwoods in eastern North America, and features a convex to planoconvex cap. 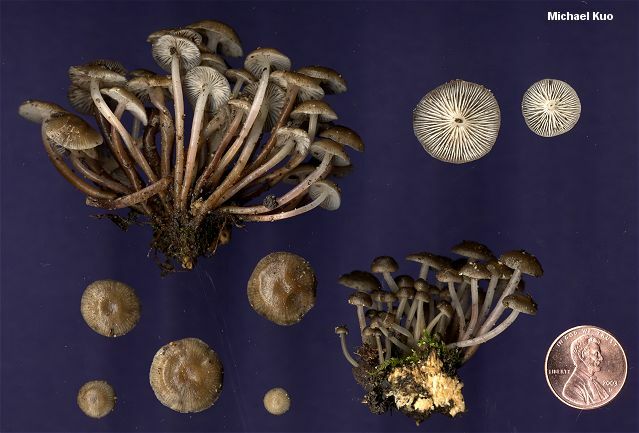 The odor is usually bleach-like (crush a cap between your fingers), and the mature stem is pale above, but brown or nearly black below. 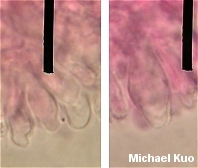 The gills are attached to the stem, or feature a tiny "tooth" that runs down the stem's apex. Under the microscope, Mycena semivestipes has very small spores and characteristic cystidia (see below). Most authors list Mycena semivestipes as a fall and winter species, but I have also collected it during a cold spell in June. 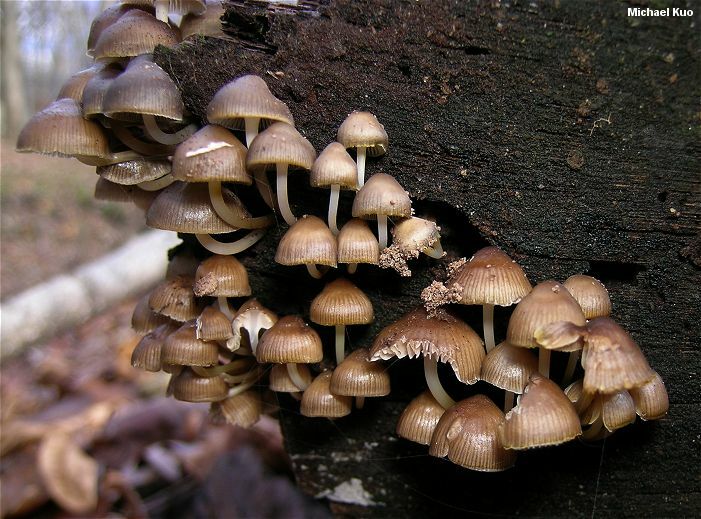 Ecology: Saprobic on the deadwood of hardwoods; causing a white rot; usually growing in dense clusters; fall and early winter (but I have collected it in a summer cold spell); widely distributed east of the Great Plains. Cap: 1-3.5 cm across; convex, becoming broadly convex or nearly flat; sticky when fresh; smooth; dark brown or nearly black, fading to brown or grayish but retaining a darker center; greasy when fresh; sometimes with reddish tones in wet weather; the margin lined. 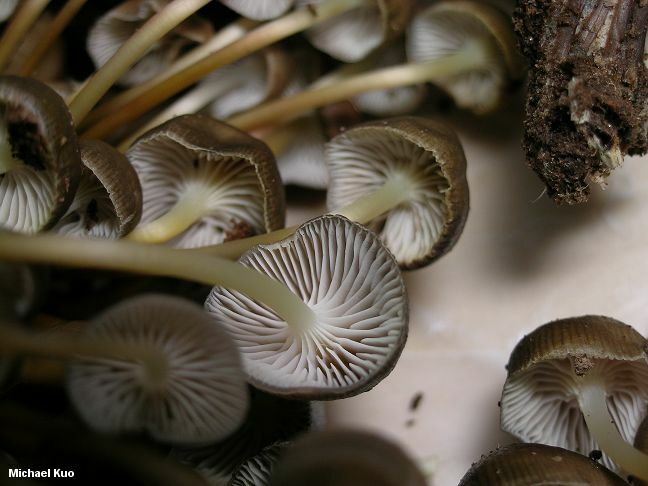 Gills: Attached to the stem, beginning to run down the stem, or attached with a "tooth" that begins to run down the stem; close; white, or pinkish with age; sometimes developing reddish brown spots. 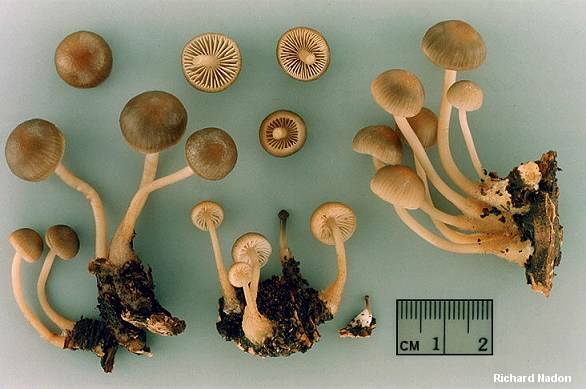 Stem: 2-6 cm long; 1-3 mm thick; fairly tough; equal; usually finely fuzzy near the base, at least when young; pale near the apex; brown to blackish near the base. Flesh: Insubstantial; pallid or brownish. Odor and Taste: Odor bleach-like, but sometimes indistinct in buttons. Taste unpleasant or slightly bitter. Microscopic Features: Spores 4-5 x 2.5-3 µ; weakly to moderately amyloid, or inamyloid when mature; elliptical; smooth. Pleurocystidia and cheilocystidia similar; to about 40 x 15 µ; club-shaped, broadly fusoid-ventricose, saccate, or irregular; sometimes developing vague projections or lobes; inconspicuous and often hard to distinguish from basidioles. REFERENCES: (Peck, 1895) Smith, 1947. (Bessette, Miller, Bessette & Miller, 1995; McNeil, 2006.) Herb. Kuo 06140306, 10310903.